Putting 2017 behind us the gym board has been erased and setup for 2018. If you added your goal late in the month with the intention of working on it going into the new year I'm sorry for erasing it. Please feel free to add it again. These Goal / Achievement columns are going to be cleaned each month so everyone gets a clean slate (no pun intended) going into the the new month. December's monthly challenge, aka 'Abcember' saw some impressive numbers! 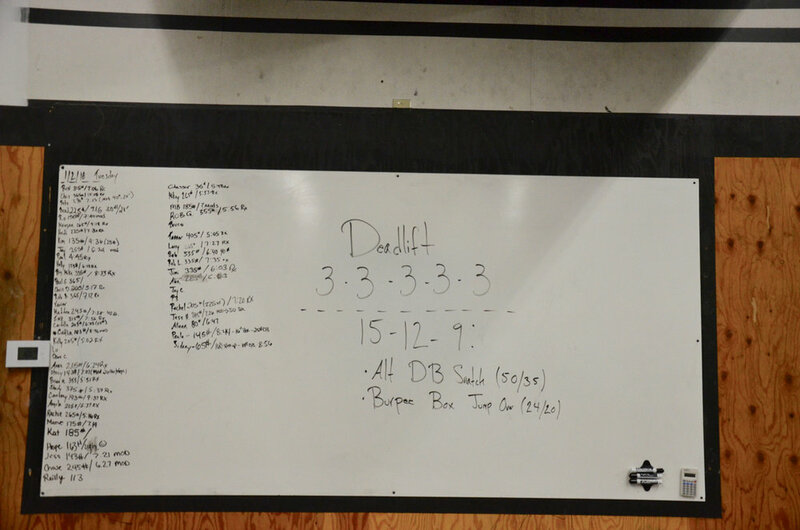 We had four core challenges on the board...sit-ups, planks, toes to bar, and L-sits. While Katelyn pulled out to an early lead on sit-ups she lost momentum throughout the month to allow Sydney took the crown with 1,000 sit-ups! Danielle deserves a very honorable mention with 700! 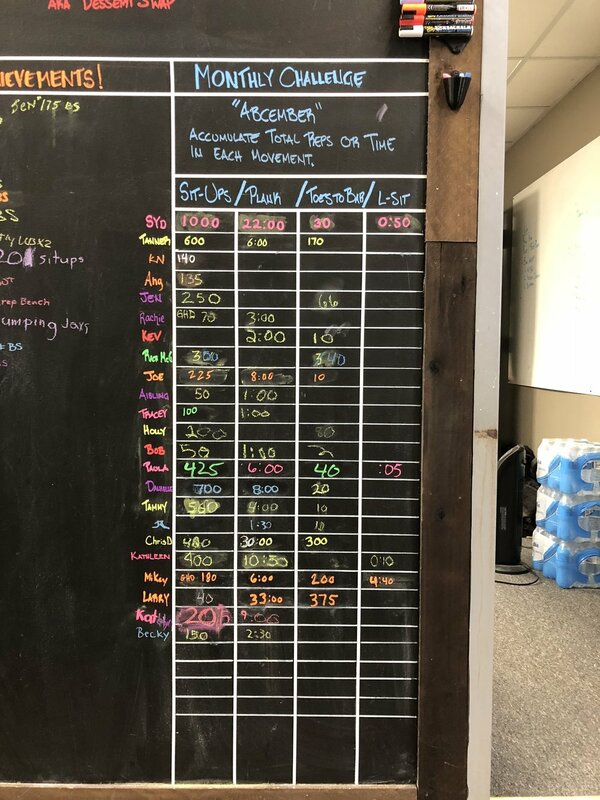 The planks were back and forth competition throughout the month...we had 4 people plank over 10:00 minutes, 3 people make it over 20:00 minutes and 2 people plank for over 30:00 minutes! Larry slightly edged out Chris to win the planks with 33:00 minutes over Chris's 30:00. The Toes to Bar were also were a tight race and involved some real strategy throughout the month. Congratulations to Rachel McG on 340 Toes to Bar and Larry on 375! The L-Sits are currently under investigation by USADA after a run away show by Coach Mikey. Kim starting off 2018 strong by attending her first 6am class. The 4pm class during their first set of burped box jump overs. Bob still working up to his 3 rep max for the day.